Tens of thousands of teachers, students, and advocates are now expected to march through the North Carolina state capitol today to demand better pay and conditions. The event has been organized by members of the North Carolina Association of Educators. “It will probably be one of the biggest events if not the biggest event that Raleigh has ever seen,” said President of the NCAE Mark Jewell. Teachers across the state will head to Raleigh, the state capital, to attend the "March for Students and Rally for Respect," which coincides with the state legislature's first day back in session. Tim Crowley, the communications manager for NCAE, explained that the march is an effort to speak to state legislators and hold them accountable for better pay and school resources. The list of demands by educators consists of an increase in per-pupil spending, investing in more mental health counselors and a commitment of more money towards building upgrades, Crowley said. Some infrastructures in the state are upwards of a century old. In North Carolina, the average teacher salary is $49,970, according to the National Education Association. The national average is $59,660. The NCAE estimates that the state's per-pupil spending is about $2,400 behind the national average. Teachers in the state have been met with some resistance. State Superintendent Mark Johnson is criticizing the decision to hold the teacher protest during school hours and had urged school districts in the weeks before not to close today. "These are local decisions made with the safety of students in mind, but I hope more school boards do not have to close schools that day," Johnson said in the statement. "We all know this affects students, parents, and other school employees. Protesting is a right, but it can be just as effective during non-school hours." 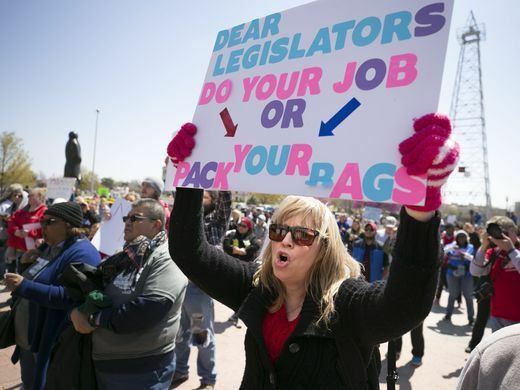 Even harsher criticism of the teachers’ movement came from one Republican state lawmaker, saying that teachers’ union ‘thugs’ are behind the protest. "The hypocrisy is that they say they are supporting the students. One less day of instruction does not help students," Rep. Mark Brody wrote on his Facebook page. "Teaching our children that it is OK to not show up for work does not set a good example." North Carolina is the fifth state this spring to see such widespread teacher activism. The rally in Raleigh comes after days-long strikes in West Virginia, Kentucky, Oklahoma, and Arizona, where teachers in those states took to striking last month for better pay and more education funding, known as the 'Red for Ed' movement, that has now taken hold in North Carolina. On the opposite side of the spectrum, close to one million students across the state of North Carolina will reportedly have the day off as teachers, educators, and staff members march on the state’s capital building in Raleigh. It was reported that administrators from school districts across the state made the decision to close schools for the advocacy day after a surge of time-off requests led to safety concerns and left administrators scrambling to find enough substitute teachers to fill vacated positions. The advocacy day consists of a morning march from the NCAE headquarters to the legislative buildings downtown. Ralliers will attempt to attend the legislative session before meeting with leaders during lunchtime. What do you think of today’s protest for better pay and school resources in North Carolina? How are the school districts where you live—do you feel that your child (or other children) are receiving the education they deserve? Should more resources be devoted to teachers? Tell us your thoughts in the comments!